The IW Biodiversity partnership has put forward ten new local Biodiversity Opportunity Areas (BOA’s) to help deliver the IW Biodiversity Action Plan. Before now, we have been focusing our work on individual sites usually designated as SSSIs (Sites of Special Scientific Interest) or SINCS (Sites of Important Nature Conservation). However, BOAs cover large areas and should enable us to work on a more landscape-scale basis. Up until now nature conservation has concentrated on protecting important sites which are often fragmented and isolated however, the identification of BOAs may help us expand sites, develop link habitats and buffer areas. Where are the IW BOAs? How were they drawn up? Here on the Island members of the IW Biodiversity Action Plan partnership came together to define the ten BOAs based on initial mapping carried out by the Hampshire & IW Wildlife Trust. Areas with the potential to improve biodiversity were mapped and this included some sites already designated and protected sites for their conservation value, important geology and hydrology. 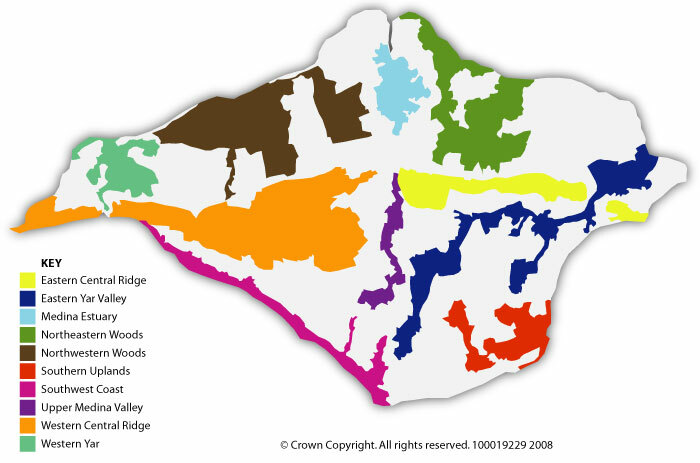 The ten IW BOAs cover 43% of the entire area of the Island, among the highest coverage of any county in the South East. Counties all across the country have drawn-up their own BOAs, to find out more about the regional picture visit the South East England Biodiversity Strategy website. BOAs do not represent a statutory designation or a constraint upon activities. They indicate where we have substantial opportunities to make positive changes for biodiversity, and should be used to inform local strategies and planning. We want to work with farmers, landowners and communities in these areas and aim to show that in partnership we can achieve social and economic objectives alongside a flourishing natural environment with wildlife-rich landscapes. BOAs are a means of indicating where large gains can be made for biodiversity. They do not contain the entire BAP habitat on the Island or indeed all the areas where BAP habitat creation or restoration is possible. Whilst they are useful in directing conservation effort, they are not the only areas where biodiversity work can be delivered. Everyone has a role to play in conservation and you should not feel discouraged to find you are not within a BOA. If you would like information or ideas about other local opportunities to be involved please contact us on ecology@iow.gov.uk. The IW Biodiversity Partnership has outlined several, collaborative projects within in the BOAs which could help maintain, restore and recreate habitats. Other counties are prioritising their BOAs however, this would be difficult for us as we are a small county and tend to carry out work as and when opportunities present themselves and funding becomes available. In 2010 we shall be undertaking a review of the current provision for biodiversity within our BOAs and this data should then help us identify where there are gaps which present opportunities helping us to further the management of land for biodiversity in these areas.